Hi all. Adam Pritchard here. I’ve been thinking about telling the story of my field experience in the Triassic-aged Chinle Formation of northern New Mexico for many years. The Hayden Quarry fossil site at Ghost Ranch has produced the best-preserved and most diverse record of American dinosaurs from the Triassic of North America, plus some of the strangest reptiles that ever lived. 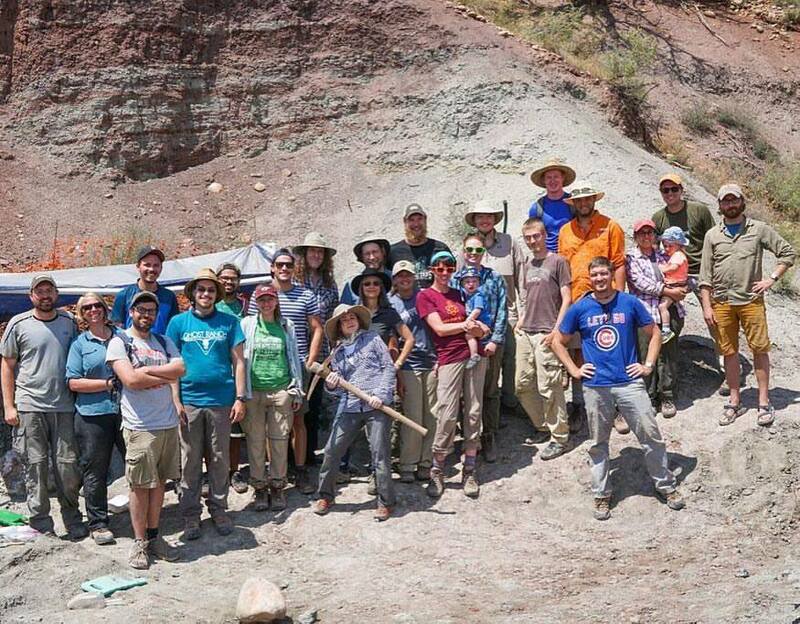 I’ve been proud to be a part of the Ghost Ranch field crew for nearly a decade now! 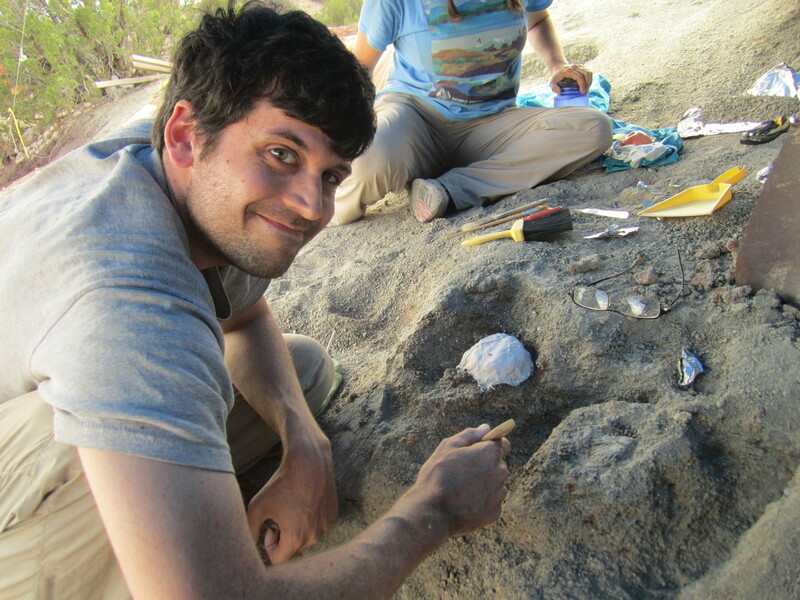 Paleontologist Adam Pritchard excavating around a mini plaster jacket, likely containing some kind of tiny reptile fossil. The 2017 Ghost Ranch field crew, standing proud by H4. Check out the Ghost Ranch exhibit in the heart of it all, filled with the awesome fossils from the Triassic Period. 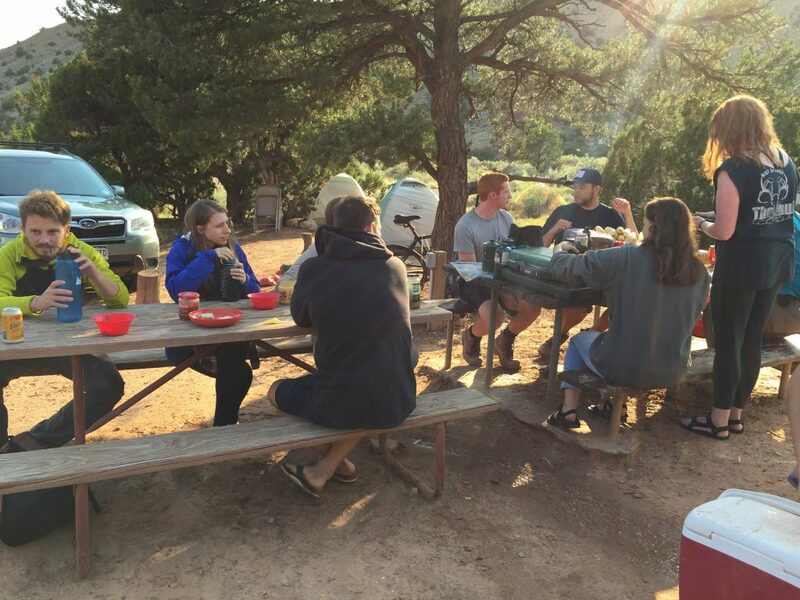 Includes links for school groups and to join tours of the local fossil sites led by Ghost Ranch staffers! In addition to summer classes, there is a winter paleontology experience at Ghost Ranch that runs through January. Members of the classes have discovered some amazing, valuable fossils from the Hayden Quarry site! Shelf Life episode about the Ghost Ranch area and dinosaur evolution. Colbert EH. 1995. Little Dinosaurs of Ghost Ranch. Columbia University Press, New York. 232 pp. Popular book on Ghost Ranch dinosaur discoveries by the great twentieth century paleontology Edwin Colbert (who deserves GREAT thanks for his contribution to the discovery of the original Coelophysis. Colbert EH. 1989. The Triassic dinosaur Coelophysis. Museum of Northern Arizona Bulletin 57:1–160. Classic paper on anatomy of the classic Ghost Ranch dinosaur and the history of its discovery. Currently not available online, as far as I can tell. Long RA and Murry PA. 1995. Late Traissic (Carnian and Norian) tetrapods from the southwestern United States. Bulletin of the New Mexico Museum of Natural History 4. Massive tome on the whole diversity of four-footed animals in the Triassic southwest, as it was understood in the 1990s. Lots of good information! Irmis RB, Nesbitt SJ, Padian K, Smith ND, Turner AH, Downs A. 2007. A Late Triassic dinosauromorph assemblage from New Mexico and the rise of dinosaurs. Science 317:358–361. The first major scientific publication from the Hayden Quarry project, detailing the dinosaur and dinosaur-cousin parts of the fauna. Nesbitt SJ, Smith ND, Irmis RB, Turner AH, Downs A, Norell MA. 2009. A complete skeleton of a Late Triassic saurischian from the early evolution of dinosaurs. Science 326:1530–1533. Description of Tawa hallae, the early theropod dinosaur unique to the Hayden Quarry fauna. Whiteside JH, et al. 2015. Extreme ecosystem instability suppressed tropical dinosaur dominance for 30 million years. Proceedings of the National Academy of Sciences 112:7909–7913. Awesome paper on the strange, unstable ecosystem and forest fires recorded in the Hayden Quarry fossil site. Lessner EJ, Stocker MR, Smith ND, Turner AH, Irmis RB, Nesbitt SJ. 2016. A new rauisuchid (Archosauria, Pseudosuchia) from the Upper Triassic (Norian) of New Mexico increases the diversity and temporal range of the clade. PeerJ 4:e2336. Description of the giant predatory rauisuchian from the Hayden Quarry site. Pritchard AC, Turner AH, Nesbitt SJ, Irmis RB, Smith ND. 2015. Late Triassic tanystropheids (Reptilia, Archosauromorpha) from northern New Mexico (Petrified Forest Member, Chinle Formation) and the biogeography, functional morphology, and evolution of Tanystropheidae. Journal of Vertebrate Paleontology 35: e911186. My own paper on the weird, long-necked tanystropheids from the Hayden Quarry. Hit me up if you can’t find a copy. Pritchard AC, Turner AH, Irmis RB, Nesbitt SJ, Smith ND. 2016. Extreme modification of the tetrapod forelimb in a Triassic diapsid reptile. Current Biology 26:2779–2786. Last and perhaps least, my recent paper on the crazy arms of Drepanosaurus, the bizarre, giant-clawed reptile. The end of a long day of fieldwork. Everyone gathers at the campground and waits hungrily for dinner. Be sure to like us on Facebook, follow us on Twitter, and give us a review on iTunes if you like the podcast!